“Culture 21: Actions” renews the commitments of United Cities and Local Governments to highlight the interdependent relationship between citizenship, culture, and sustainable development. 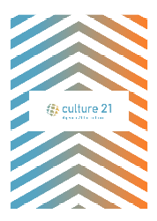 “Culture 21: Actions” supplements the Agenda 21 for Culture and transforms it into concrete commitments and actions. “Culture 21: Actions” aims to be an international guide that is applicable all over the world and that promotes knowledge. “Culture 21: Actions” facilitates the exchange of good practices. “Culture 21: Actions” strengthens a global network of effective and innovative cities and local governments. Do you want to implement Culture 21 Actions in your city?